Conveniently located within minutes of the Dubai International Financial Centre and Downtown Dubai, Carlton Downtown offers stylish accommodation on famous Sheikh Zayed Road. Just a short drive from the Dubai Mall and iconic Burj Khalifa, the hotel is located in Trade Centre 2 and is home to an excellent range of onsite facilities. Just 20 minutes from the Dubai International Airport, the hotel offers an airport and local area shuttle service and is close to a variety of popular local shopping, dining, activities and attractions including Skyline and Ski Dubai. Located on one of the most famous roads in Dubai, Four Points By Sheraton Sheikh Zayed Road, Dubai offers a stylish range of accommodation within walking distance of Emirates Towers Station. Situated in Trade Centre 1, the hotel boasts impressive views of the Jumeirah coastline with floor-to-ceiling windows and is home to a great range of onsite facilities. Close to Duabi Mall, Dubai World Trade Centre and the Financial and Exhibitions Centre, the local area is renowned for its fantastic shopping, day spas and photo opportunities. Situated in Trade Centre 2 on the bustling icon of Sheikh Zayed Road, Jumeirah Emirates Towers is an award-winning hotel offering elegant accommodation and an excellent range of onsite facilities. Just minutes from a variety of popular local activities and attractions, the hotel is close to famous Dubai Mall and enjoys access to the private beaches of sister property Jumeirah Beach Hotel with a complimentary shuttle service between properties. Conveniently located in Downtown Dubai just 20 minutes from the Airport and within walking distance of the Dubai Mall, Manzil Downtown Dubai offers all the comforts of modern accommodation surrounded by the beauty of traditional Arabic architecture. Home to an excellent range of onsite facilities, the hotel offers a variety of accommodation options and is close to popular local attractions such as the Burj Khalifa, Souk al Bahar and the Dubai Fountain. 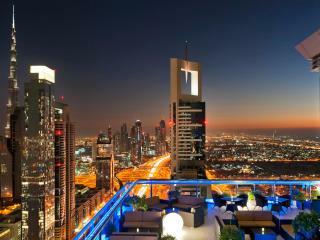 Just 15 minutes from Jumeirah Beach, the hotel is also close to a variety of local dining options and health spas. Located just minutes from Dubai Mall and the famous Burj Khalifa, Shangri-La Hotel Dubai offers Arabian-inspired luxury accommodation on iconic Sheikh Zayed Road. Conveniently situated within minutes of the Financial Centre Metro Station, the hotel is perfectly positioned for exploring the local area. Just 15 minutes from Dubai International Airport, the hotel is home to an excellent range of onsite facilities and is close to popular local shopping, dining, activities and attractions. Located on iconic Sheik Zayed Road, these hotels enjoy easy access to popular landmarks and attractions including the Burj Khalifa, Dubaui Fountain and Dubai Mall.